The 3200 XLT Concrete Scarifier Self-Propelled Attachment removes mortar, elastomeric membrane, sidewalk trip hazards, highway lines and failed concrete cap. An excellent concrete surface preparation tool, the 3200 XLT Concrete Scarifier attachment can remove existing epoxy coatings, thin set from ceramic tile installations, concrete underlayment leveling compounds, failed concrete topping and grout prior to the application of new coatings. One person can run the 3200 XLT Scarifier attachment an entire eight-hour shift. 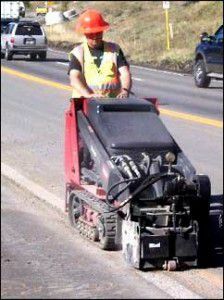 It is completely self-propelled to prepare concrete surfaces. 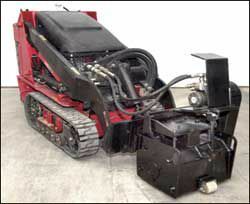 The scarifier can be driven forwards or in reverse while constantly grinding the surface. The unit does not need to be lifted from the substrate until the job is completed. This feature, along with removal of operator fatigue greatly increases job production schedules. Downsizing of crew members needed to complete the concrete surface coating removal and preparation not only saves labor cost, also it cuts Workmen’s Compensation cost and minimizes accident liability from personal injury. This multi-purpose attachment is also used for concrete milling and planing of irregular surfaces to remove raised areas in the leveling process. Also new drainage patterns can be achieved in areas holding water. The concrete scarifier can remove 1/4″ of material per pass. The “floating” grinder head follows the contour of even surfaces to produce flat or beveled substrate removal. Additional the 3200 XLT Scarifier removes highway lines and crosswalk thermoplastic markings with very minimal damage to existing pavement. 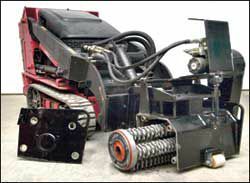 Maintenance to the scarifier attachment along with cutter drum change out is easily accomplished by raising the scarifier to a comfortable height while coupled to the skid steer host machine. Average cutter drum change out is five minutes.